The loss is estimated to be around Rs 15 crore, while over 900 villagers have been rendered homeless. There were reports of the area receiving mild snowfall towards the evening. Though the rescue team of the Kullu administration was yet to assess the exact loss, villagers said over 150 houses had been destroyed completely while 15 others were partially damaged. Most of the affected families could save not even a single penny from the devastating fire. “We had gone out to arrange fuel wood in the morning as the weather had turned cloudy. However, when he came back, the entire village was on fire,” said Ganga Singh and his family members. Their house was the first to catch fire. “We are ruined, as we could not save even a single penny from the fire,” they said. Dry wood and haystacks lying in the wooden houses helped the fire spread very fast and the flames soon engulfed the entire lower part of Malana. Most villagers stock valuables and cash in their houses as there are no banks in the village. The main temple of Jamlu Devta was also gutted. Only one temple, Dev Sadan, survived the fire. Jagdish Sharma, spokesperson the Everest Company, which is executing the 105-MW Malana stage-I project on the Malana khud, said the fire destroyed two of the three wards in the village. “Human efforts could only save the upper portion of the village having around 110 houses,” he said. 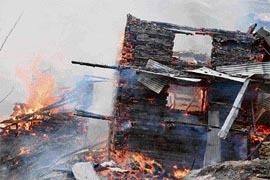 Budh Ram said the fire victims had been accommodated in over 110 houses that survived the catastrophe. The fire tenders that were rushed from Kullu around 10 am were of no use as there is a steep climb of around 1 km from the Jhiri-Malana road and that stretch of the road is still under construction. The cause of the fire could not be ascertained so far. Kullu DC Abhishek Jain, who reached spot in the evening, said the administration had given an immediate relief of Rs 5,000 to each family rendered homeless and Rs 3,000 to those whose houses had suffered partial damage. They were also provided free ration, he added. “The villagers have been rehabilitated in the houses that were not affected in the fire. We are assessing the exact loss. The rough estimate is around Rs 15 crore. The villagers will get compensation as per the relief manual,” officials added.